Yesterday BART spent the day on the Wellow Brook assessing fish passage on three weirs in Radstock. We measured the physical characteristics of the weirs including water depths, height and length of structure and also flow velocities and inserted these into a database which calculates the passability of the structures for a number of different species. 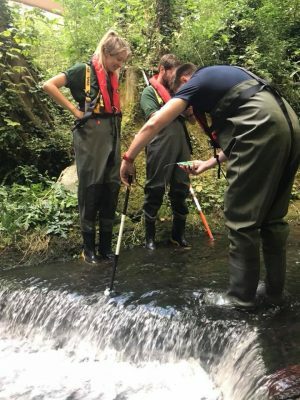 Unfortunately, the database confirmed that all three barriers presented a barrier to a range of fish species and therefore we will be investigating weir removal possibilities or fish passage options for these in the future. This work is part of our wider Wellow and Cam Initiative which we have been working on for a number of years but which has picked up a lot of pace recently. 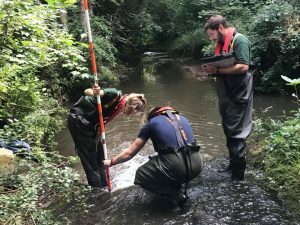 The initiative includes: weir removals and fish passage surveys, coppicing, instream work, river corridor surveys, macroinvertebrate surveys, electrofishing surveys, land management advice , education and much more. This piece of work was funded by Tesco Bags of Help – thanks to everyone who voted for us with your tokens in store!